This Giveaway is only open to legal residents of the fifty (50) United States (including the District of Columbia), who are the 13 years of age or older at the time of entry. Employees of Red Light Management (“RLM” or “Sponsor”), Wonderful Union (“Wonderful Union”) and any promotion or other vendor agency involved in this Giveaway (and any other person engaged to work on this promotional program) and each of the above’s respective affiliates (collectively, the “Released Parties”) and the household and immediate family members (defined for the purposes of this Giveaway as a parent, spouse, child, and sibling) of such employees are not eligible to enter or win. Giveaway is subject to all federal, state, and local laws and regulations. Void where prohibited or restricted by law. 1. a) To enter online via the My Morning Jacket website, you must purchase a “It Still Moves“ pre-order bundle, box set, physical CD or vinyl. You can find this album at mymorningjacket.com*. For each album you purchase, you will receive one (1) entry into the applicable Entry Period drawing. *Please note this opportunity is only available to fans who pre-ordered the album through the official My Morning Jacket merch store. Mail-in entries must be postmarked by the end date of each Entry Period and must be received within seven (7) calendar days from the end date of an Entry Period to be eligible. Limit one (1) entry per outer mailing envelope. Neither the Sponsor nor its affiliated or related entities are responsible for lost, late, incomplete, inaccurate, misdirected, damaged, unintelligible, postage-due, or returned entries. Three (3) Grand Prize Winners will receive concert tickets to any shows of their choice. Grand Prize includes: Two (2) tickets to any My Morning Jacket shows. The winner will get to choose which shows they would like to attend from My Morning Jacket's upcoming 2016 The Waterfall tour schedule. Three (3) Runner-up Winners will receive a signed test pressing. 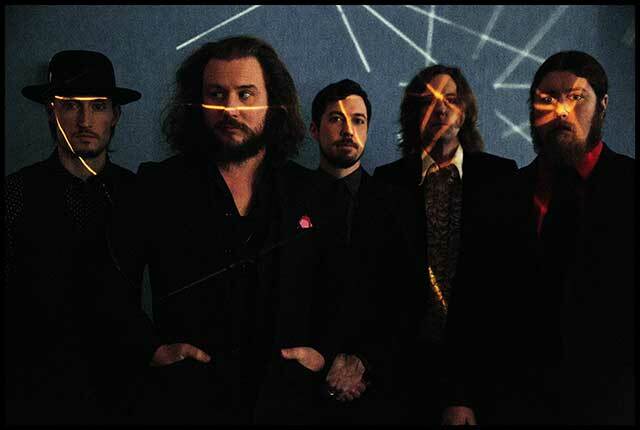 Prizes do not include air or ground transportation, taxes, tips, gratuities, service charges, parking fees, hotel accommodation or any other expenses associated with attending a My Morning Jacket event. Prize winners are responsible for all expenses, fees and taxes not expressly included in the prize packages. All winners will be notified by phone/email to the phone number/email address indicated during entry. Restrictions/conditions are as follows: No one off shows, No secret shows or special events, No festivals, No TV appearances, No VIPs, Non-transferable, No monetary value, Must be redeemed for a concert that is part of The Waterfall 2016 tour, All sales final, No returns or exchanges on promo items, Winners must request tickets at least 7 days in advance of show date, Management has final discretion to approve or deny any request, regardless if request was submitted in the proper time frame. By entering, entrant agrees to accept and abide by the Official Rules of this Giveaway and agrees that any dispute with regard to the conduct of this Giveaway, rule interpretation, or award of prize, shall be resolved by Sponsor, whose decision shall be binding and final. This Giveaway is governed by the laws of the State of New York, and entrant consents to the exclusive jurisdiction and venue of the Courts of the State of New York for any disputes arising out of this Giveaway. All federal, state, and local laws and regulations apply. By entering, entrant agrees to be notified using the phone number/e-mail address provided on the entrant’s Official Online Entry Form by the Sponsor for the purposes of the administration of this Giveaway. By participating, entrant agrees to release and hold harmless the Released Parties from any injury, loss or damage to person, including death or property damage due in-whole or in-part, directly or indirectly to the acceptance, use, or misuse of a prize, participation in any Giveaway-related activity, or participation in the Giveaway. Sponsor and the other Released Parties are not responsible for any typographical or other error in the printing of this offer, administration of the Giveaway or in the announcement of prizes, including such error as may give an erroneous indication that a prize has been won. In the event the Sponsor is prevented from continuing with this Giveaway, or the integrity and/or feasibility of the Giveaway is undermined by any event including but not limited to fire, flood, epidemic, earthquake, explosion, labor dispute or strike, or public enemy, satellite or equipment failure, riot or civil disturbance, war (declared or undeclared), terrorist threat or activity, or any federal, state, or local government law, order or regulation, order of any court or jurisdiction, or other cause not reasonably within the Sponsor’s control (each a “Force Majeure” event), the Sponsor shall have the right, in its sole discretion, to abbreviate, modify, suspend, cancel, or terminate the Giveaway without notice or further obligation. If the Sponsor, in their discretion, elect to abbreviate the Giveaway as a result of a Force Majeure event, the Sponsor reserve the right, but shall have no obligation, to randomly select the winner(s) from among all valid and eligible entries received up to the time of such Force Majeure event. For the names of the Grand Prize and Runner-up Winners, send a self-addressed stamped envelope to: My Morning Jacket Giveaway List, Attn: Wonderful Union, 1600 Raleys CT | Suite 10 West Sacramento, CA 95691 postmarked by April 18, 2016 and received by May 30, 2016. This Giveaway is sponsored by Red Light Management, http://redlightmanagement.com/. This Giveaway is administered by Wonderful Union LLC, 120 K St, Sacramento CA 95814.